The new Moticam BTU8 tablet microscope camera delivers a new dimension of engagement for teachers, students or any user wanting to share their microscope experience with others. 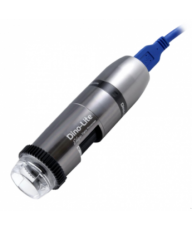 The BTU8 converts any traditional microscope into a stand-alone digital documentation lab and WiFi hotspot, allowing users to share images with classmates and colleagues without needing a computer. An intuitive Android OS and touch-screen simplicity makes the BTU8 an impressive and welcome tool for teachers and students alike. The BT8U touch-screen tablet camera is built around a bright 8-inch LCD screen with 1.0MP display resolution, and driven by a powerful 1.6 Ghz Quad Core processor. The onboard Android 4.2 operating system creates an intuitive and easy-to-use interface for teachers, students and users of all experience levels. An integrated 3000mAh Li-ion battery, 8Gb of internal storage and 1Gb of DDR3 memory deliver the performance required for professional image and video documentation. An integrated microphone, speaker and earphone jack allow for easy creation and editing of audio notes, greatly enhancing the learning process. 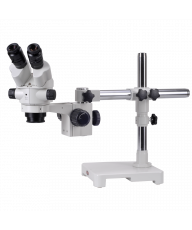 The BTU8 features a pivoting support frame to hold the display in any desired position, and the frame mounts to any C-mount microscope camera adapter. NOTE: This camera requires a trinocular microscope and a C-mount adapter appropriate to the microscope being used. Please call us at 877-409-3556 for assistance in choosing the correct adapter. The BTU8 is controlled by the popular Android 4.2 OS, a familiar face to millions, and an easy-to-learn system for new users, thanks to intuitive menu icons and effortless navigation between screens. In addition, Motic's free App "MotiConnect" lets users easily capture 5.0MP images or 720P video for viewing, editing and sharing via Bluetooth or WiFi to multiple Apple or Android devices, all at the touch of a finger. In addition, a built-in Micro-SD card slot allows exporting images directly to an included 4Gb SD card. An HDMI port offers 720P resolution HD live images for simultaneous display on a big screen HDMI TV or projector, making it ideal for classroom use. Ideally suited for schools and small training laboratories, it incorporates full C-Mount compatibility and the rugged metal housing makes this unit appropriate for use in academic, scientific and industrial environments. It is also easy to install and use...you will enjoy clear, detailed color images on the LCD screen or your HDMI monitor or projector with a minimum of effort. In short, these well-designed tablet microscope cameras offer an affordable introduction to digital microscopy. 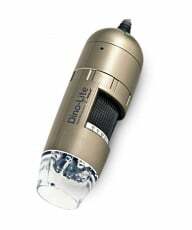 We recommend them for any classroom or teaching laboratory application requiring image capture, sharing and documentation. >CD-ROM Software disc, 4-dot calibration slide, 4 Gb Micro SD card, Universal Power supply (100V-240V), USB cord, C/CS Spacer ring, HDMI Cable, C-mount standard mounting frame. Allen wrench. MOTIC PART # 1100600100853. The new Moticam BTU8 tablet microscope camera delivers a new dimension of engagement for teachers, students or any user wanting to share their microscope experience with others. 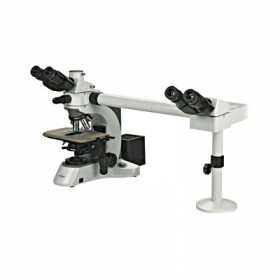 The BTU8 converts any traditional microscope into a stand-alone digital documentation lab and WiFi hotspot, allowing users to share images with classmates and colleagues without needing a computer. An intuitive Android OS and touch-screen simplicity makes the BTU8 an impressive and welcome tool for teachers and students alike. FeaturesThe BT8U touch-screen tablet camera is built around a bright 8-inch LCD screen with 1.0MP display resolution, and driven by a powerful 1.6 Ghz Quad Core processor. The onboard Android 4.2 operating system creates an intuitive and easy-to-use interface for teachers, students and users of all experience levels. An integrated 3000mAh Li-ion battery, 8Gb of internal storage and 1Gb of DDR3 memory deliver the performance required for professional image and video documentation. An integrated microphone, speaker and earphone jack allow for easy creation and editing of audio notes, greatly enhancing the learning process. 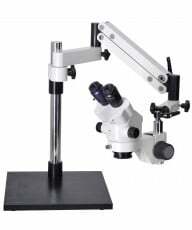 The BTU8 features a pivoting support frame to hold the display in any desired position, and the frame mounts to any C-mount microscope camera adapter.NOTE: This camera requires a C-mount adapter appropriate to the microscope being used. Please call us at 877-409-3556 for assistance in choosing the correct adapter.OperationThe BTU8 is controlled by the popular Android 4.2 OS, a familiar face to millions, and an easy-to-learn system for new users, thanks to intuitive menu icons and effortless navigation between screens. In addition, Motic's free App "MotiConnect" lets users easily capture 5.0MP images or 720P video for viewing, editing and sharing via Bluetooth or WiFi to multiple Apple or Android devices, all at the touch of a finger. In addition, a built-in Micro-SD card slot allows exporting images directly to an included 4Gb SD card. An HDMI port offers 720P resolution HD live images for simultaneous display on a big screen HDMI TV or projector, making it ideal for classroom use. Ideally suited for schools and small training laboratories, it incorporates full C-Mount compatibility and the rugged metal housing makes this unit appropriate for use in academic, scientific and industrial environments. 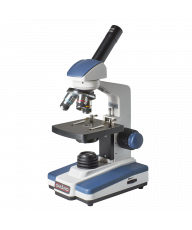 It is also easy to install and use...you will enjoy clear, detailed color images on the LCD screen or your HDMI monitor or projector with a minimum of effort.In short, these well-designed tablet microscope cameras offer an affordable introduction to digital microscopy. We recommend them for any classroom or teaching laboratory application requiring image capture, sharing and documentation.SoftwareThe included Motic Images Plus software offers PC/MAC compatibility and simple, accurate and easy-to-use controls for image capture, notation and measuring. File formats include JPG, BMP, TIFF, RAW. Measuring capabilities include length, width, height, thickness, circumference, radius, angles and dot counts while notations can be easily made on any given image. The software also includes auto white balance and color enhancement among other benefits while image capture and storage is intuitive. The software is also fully TWAIN and DirectX compatible, allowing simple integration with a wide range of commercial and scientific imaging software. Moreover, both TWAIN and DirectX plug-ins are independent of the main driver, which allows discreet control of the camera for these applications. Accessories>CD-ROM Software disc, 4-dot calibration slide, 4 Gb Micro SD card, Universal Power supply (100V-240V), USB cord, C/CS Spacer ring, HDMI Cable, C-mount standard mounting frame. Allen wrench. MOTIC PART # 1100600100853.